In the early 1800's white settlers came to this continent and brought with them terrible stories about wolves that had more to do with frightening little children into behaving than they did the truth. They told horrifying tales of bloodthirsty beasts who lay in wait for unsuspecting humans to stroll by in order to devour them. Unfortunately, these fables were nurtured and passed on from generation to generation, growing taller on down the line... until they helped to cast the wolf in the role of "devil incarnate". Most people believe, in some form or fashion, that wolves howl at the moon, view humans as a food source, weigh in at 200 Ibs., and are driven mad by the scent of blood. None of this is true. What we know about wolves you can fit into a thimble. What we don't know about them may never be measured. During the last 50 to 80 years this animal has been relentlessly hunted to the brink of extinction. At first glance you might see the obvious - wolves are predators. When non-natives came here to "tame" this land, they replaced wild game with domestic stock. Hard winters occasionally drove wolves to prey on these animals, although wolves will generally pass up livestock in favor of wild game. It was economic interest that these men sought to protect and their means to that security was to kill the wolf, not for what he'd done... but, for what they thought he might do. The wanton destruction of wolves goes far beyond the "predator control" programs used to mask the real agenda. Wolf killers each have their own reasons; some trap them for fur, mercenaries, like Animal Damage Control (ADC) kill them for cash, ranchers trap, shoot and poison them claiming they're protecting livestock - although wolf predation in the ranching industry is less than one half of one percent. Ranchers have more to fear from vegetarians than wolves. Unfortunately, the public will often condone these activities out of nescience. There is a sickening wake of death and destruction trailing us with regard to anything we don't understand. Indeed, the fate of the buffalo and the American Indian are prime examples of such adamant unwillingness to embrace a larger perspective of our place in the universe and to practice respect for the other inhabitants of this planet. General attitudes with concern to most all natural predators is met with the same ignorance and misunderstanding - but the scorching, unbridled hatred for wolves was so far beyond reason and control that I am convinced that it was only by an act of God, that even one survived. 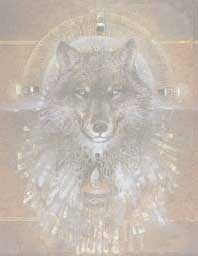 Here is a great collection of wolf pictures I have gathered from the net. I hope you enjoy.